Ed Gorman asks the GM children question in “The Baby Store.” Kevin and Jen McKay just lost their own modified child, Kevin Junior, to drowning, and Kevin is now secretly doing something he is certain would hurt and anger his wife greatly: looking at new potential children at the “baby store.” The story reveals in brief, but slowly building, painful detail that Kevin Junior was one of those rare statistics where the modification process didn’t go quite right, and he would always be well behind his peers no matter how hard he tried, and… and, there is actually an underlying tragedy behind the boy’s death that sneaks up on the reader until it’s ready to slap you. In Brian Stableford’s “The Great Chain of Being,” 36-year-old Sarah Whitney is dying of a cancer that hasn’t responded to any treatments and has decided on a death that’s unusual but growing in popularity: she wants her body turned into a tree. Sometime in the past, America was ravaged by what appears to have been a continent-wide eco-catastrophe, and now the land is being repopulated by trees that were once people. Sarah is well aware that this won’t mean any continuity of consciousness, and her husband is the loudest critic — he wants her to keep fighting the cancer, not to mention being a little dubious about both the whole process and the intentions of the people doing it. Don’t expect any surprise endings or great revelations here; “Being” is an introspective story about life and death without becoming too maudlin, saccharine, or preachy, and is among the strongest in the anthology. The protagonist of Kristine Kathryn Rusch’s “The Power of Human Reason” is considered an antique by most of his co-workers on the police force — not because he’s in his eighties, which is the new middle age, but because he relies as much if not more on gut instinct, on human reason, than technology. When a multiple murder case comes along that the technology cannot solve, the younger cops are shaken but he simply regards it as a challenge — and a way to hold onto his job awhile longer, if he can solve it. The mystery itself is compelling and Rusch manages to believably pull off one that could only have been solved with experience and instinct rather than computers and analysis. Still other tales do quite well carrying on with the “one step away from here” idea. For example, “The Rotator,” by Pamela Sargent, could literally take place where the future America happens to be tomorrow, when a President Bush and Vice President Cheney from an alternate America switch over to one were they aren’t quite as unpopular. Mike Resnick and Linda Donohue’s “The Last Actor” explores an America dominated by a pop culture that has even crushed Shakespeare with a humor flowing on pathos. Meanwhile, massive overpopulation in Donald J. Bingle’s “Attached to the Land” sees America adopting a growth policy that China can only envy, and carries a hammer blow hitting all the harder for the story’s brevity. A more hopeful outlook imbues Jane Lindskold’s “Unlimited,” which looks at the possibilities of cloning prehistoric mammals to bring them back to the world, and while the story definitely has its serious moments, the characters — and perhaps the author, one might presume — are having a great deal of fun bringing this past into their own futures. “Better Guns,” by Jean Rabe, deftly mixes the humorous and serious by offering us characters who have suffered under restrictive anti-terror laws that include the confiscation of all weapons except museum pieces. Our “heroes” put up with their deprivations until the government foists on them one final insult that they just refuse to bear: the president has taken over Graceland as his official residence. No doubt there will be readers coming to Future America who, like me, wondered if it would contain a story that featured an America long ruined by her imperial-style vices and overreaching. Maybe for that reason the very first story is Brendan DuBois’s “A Souvenir To Remember,” about a rich and bored young fellow named Armand who is in what used to be Washington and decides he wants a tour of the “ruins,” which we today would know as The Mall: that famous stretch between the Lincoln Memorial and the Capitol. Instead of what could have been a dragged-out laundry list of “Here’s what’s left of the Capitol, here’s what left of this Smithsonian museum,” Dubois skillfully offers up different aspects on what was truly lost, each wreck a symbol for what we had and either squandered or abused or both. The souvenir of the title is something that we today would barely give a second look, but which Armand considers incredibly precious as a reminder, and made this writer want to take a closer look at his own such souvenir the next time one came into his hands. On the other side of expectations is “Switching Off the Lights” by Peter Crowther, a story whose title is exactly as it sounds: the end of the entire world. The means for interstellar travel also wound up damaging the planet beyond repair, and as far as the Stuczi family knows as they’re preparing their own escape rocket, they may be the last family in America. Their flight will be dangerous and statistically doomed to fail, but Crowther nicely has father Jerry comforting his children not with platitudes or fairy tales, but with the probabilities of quantum theory — an effective spoonful of hope in this very short piece. While the story quality certainly varies, there isn’t a klunker to be found in Future Americas, nor (for good or ill) anything that isn’t utterly outside the broader realms of possibility. Readers looking for post-apocalyptic stories should look elsewhere; sometimes the apocalypse simply doesn’t happen and people are either forced to grind on through their circumstances or able to keep working towards an optimistic light while managing to survive the crush of daily history. Those kinds of stories are in ample supply here. There’s quality to every piece, and in each one a clear window to what might yet be. Danny Adams is the author of the forthcoming early medieval historical novel The Matter of Camelot (Musa Publishing) and the co-author, with Philip Jose Farmer, of the short science fiction novel The City Beyond Play (PS Publishing). When he’s not writing, he’s also a college librarian and a speculative fiction reviewer for Publishers Weekly. Most of the time he lives in the Blue Ridge Mountains of Virginia; the rest of the time, don’t bother trying to find him. 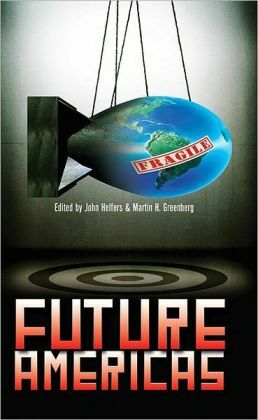 Click to purchase Future Americas on Amazon.com . This entry was posted in Danny Adams, John Hellers, Martin H. Greenberg. Bookmark the permalink.